The German Research Foundation approves a four-year extension of the Collaborative Research Center 910 on control of nonlinear systems. TU Berlin continues in the role of the host university. Professor Dr. Sabine Klapp is coordinator of the Collaborative Research Center 910 on control of nonlinear systems. 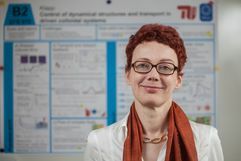 She is also head of the Chair of Computer Simulations and Theory of Complex Fluids at TU Berlin. The German Research Foundation has approved, for the third time, funding for the Collaborative Research Center 910 on control of nonlinear systems, with TU Berlin being the host university. Coordinator of the Collaborative Research Center is Professor Dr. Sabine Klapp. Professor Klapp is head of the Chair of Computer Simulations and Theory of Complex Fluids at TU Berlin. Eight million euros of funding has been made available for research over the next four years, thus bringing the total funding for the Collaborative Research Center over a twelve-year period to EUR 20 million. The full title of the Collaborative Research Center 910 is “Control of self-organizing nonlinear systems: Theoretical methods and concepts of application” and its work focuses on innovative control strategies for systems on a range of scales. A new feature of the Collaborative Research Center in the third funding period is an integrated research training group. 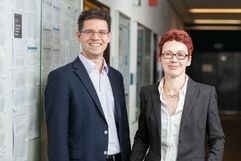 Professor Sabine Klapp and Roland Aust are delighted that Collaborative Research Center 910 on control of nonlinear systems is being funded for another four years. Professor Klapp is coordinator of the Collaborative Research Center and head of the Chair of Computer Simulations and Theory of Complex Fluids at TU Berlin. Roland Aust is managing director of the Collaborative Research Center. The Collaborative Research Center (CRC) 910 focuses on dissipative, nonlinear dynamical systems beyond thermal equilibrium. Such systems are common in physics, chemistry and biology. Examples include open quantum systems, flowing liquids and pulsating heart tissue. A characteristic feature of such systems is self-organization, that is, the spontaneous emergence of temporal, spatial or temporal-spatial structures. The Collaborative Research Center’s objective is to generate and control such self-organizing dissipative structures, e.g., for the optimization of specific material properties. By combining an interdisciplinary team of applied mathematicians, theoretical physicists, and computational neuroscientists the CRC aims at developing novel theoretical approaches and methods of control, and demonstrating the application of these concepts to a selection of innovative self-organizing systems ranging from condensed hard and soft matter to biological systems. To meet these challenges, the CRC will merge and advance concepts from the control of nonlinear dynamical systems, the classical mathematical control and optimization theory, and coherent quantum control. The focus is on theoretical and methodological developments from a conceptual point of view and with a perspective on applications. One of the key methods used by the CRC 910, which was founded 2011 by Prof. Dr. Dr. h.c. Eckehard Schoell, is feedback control where unstable states are stabilized adaptively. A specific example is time-delayed feedback control, which the Collaborative Research Center has successfully put forward to novel systems during the first two funding periods. The main areas of application in the third funding period are the control of dynamics in quantum nanostructures and topological quantum information systems, the control of complex and active fluids in non-equilibrium, and the control of excitable media, such as heart tissue and macroscopic brain networks. The Collaborative Research Center is divided into two project areas: theoretical methods (A) and concepts of application (B). These areas comprise 16 research projects, including a project in Russia. Project area A deals with theoretical and methodological development for self-organizing nonlinear systems, combining expertise from the research areas of theoretical physics and mathematics. The objective is to achieve a fundamental understanding of the successful control of self-organizing processes. Project area B focuses on the application of the control principles developed in project area A on paradigmatically selected, innovative model systems from physics, chemistry and biology. In particular, the control of excited quantum systems, colloidal matter, complex fluids, heart tissue, brain networks, lasers or chaotic oscillators will be explored and developed. The dynamics in such systems include a wide spectrum of nonlinear phenomena on various spatial and temporal scales, which can be controlled using a range of strategies. The research projects will be accompanied in the third funding period by an integrated research training group entitled “Design and control of complex systems” to be led by Professor Dr. Holger Stark, Dr. Alexander Carmele (both from TU Berlin) and Professor Dr. Alexander Mielke from the Weierstrass Institute for Applied Analysis and Stochastics (WIAS). The promotion of outstanding young scientists as well as special measures concerning gender equality for scholars and the compatibility of academic and family life are an issue of particular importance to the Collaborative Research Center. Measures are planned on all stages of the academic career. These measures include, for example, financial support of particularly innovative projects of young scientists, enabling them to build up an independent profile. Mentoring programs are being used to attract women to pursue an academic career and to assist the advancement of women within academia. Further, exchange and cooperation programs enable students to be involved at an early stage in their careers into international cooperation activities with leading research groups. The new integrated research training group offers doctoral candidates and scholarship holders within the Collaborative Research Center a structured doctoral program providing them with the best possible prospects for a successful start to their careers.